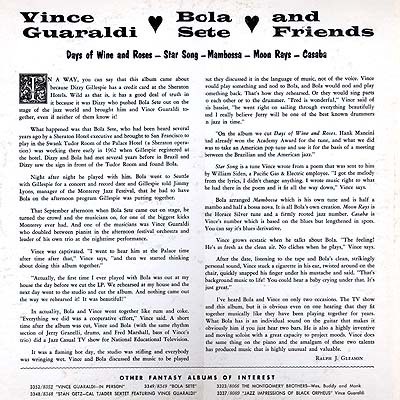 Notes: The liner notes by Ralph J. Gleason tell the tale of Vince and Bola being brought together by none other than Dizzy Gillespie. After hearing each other play it was only natural to roll some tape while they traded parts back and forth. 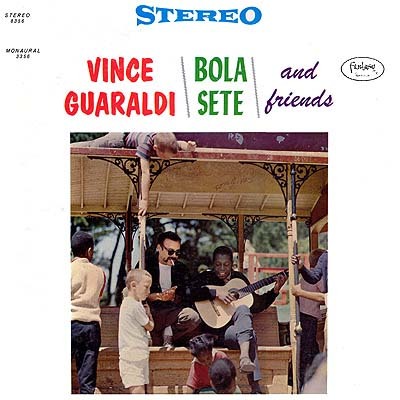 This being only the second time they had played together (the other being the night before the sessions at Guaraldi's house) the feeling is loose without wandering. To quote Vince, "That's the background music to life!". The uncredited cover photo is a casual peek a at couple friends playing a bit of music in the shade on a warm summer day. A fanatic record all around.